Starhunter lets you send customized emails to groups of contacts. Create your own templates with placeholders for names, salutations, dates and more. Groups can be defined by tags, projects, and completely customized. 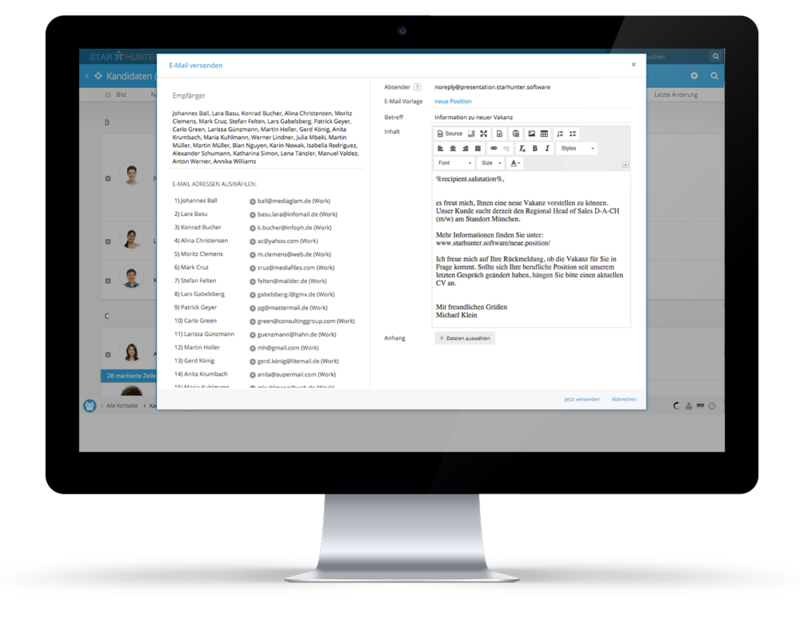 Keep candidates up to date, market to customers or send memos to your team. We recently expanded our project and now offer career coaching. We knew not all of your customers check our website regularly, so we decided to send out an emailing through Starhunter. We mark our top customers with an ‘A’ tag which made it really easy to filter for the right customers and spread the good news. Almost 50% of the customers we contacted answered and asked for more details on our career coaching.